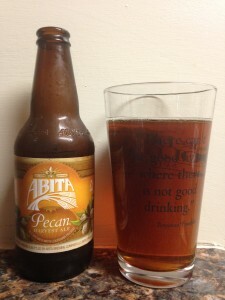 Tonight I give you Pecan Harvest Ale from the Abita brewing company, Abita Springs, LA. It has a great caramel color and scent with a slightly “nutty” flavor. It has a 5.2% alc content and is a great Fall after dinner beer! I give it 3.5 stars, enjoy!